My quest in drones is almost entirely driven by my desire to capture cool sports shots from the air, primarily of myself in a solo-setting. 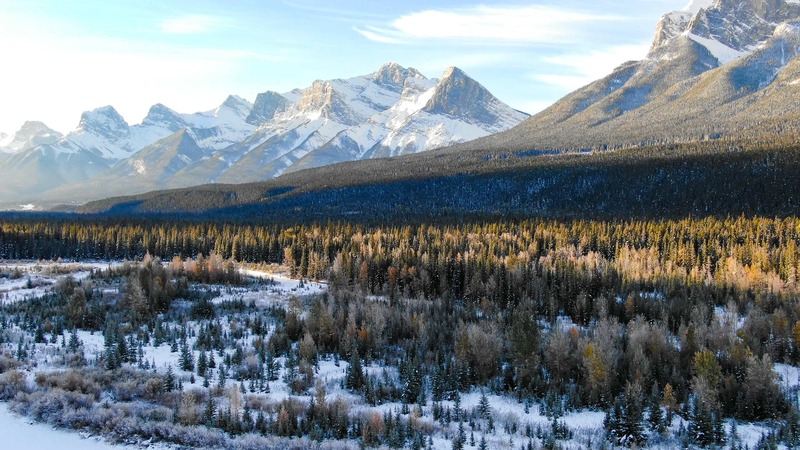 It’s one thing to have a drone for epic cinematic shots of sweeping landscapes – but it’s an entirely different thing to nail that awesome shot of yourself riding through those epic landscapes. All without outside assistance. And ideally at a super high quality level. For that, you need a drone that can actually track you. You simply can’t ride your bike down a steep descent at full speed while also controlling where the drone is and how it’s pointed. Yes, you want to maintain safety control over it at all times, but you basically want it to fly itself and get the best shots of you. And thus the center of my drone quest. I’ve tried all of them over the years. 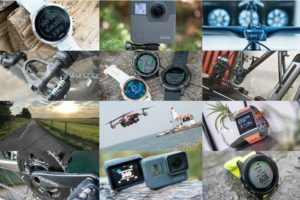 From DJI to GoPro, AirDog to Skydio, Parrot to Staaker, and countless other brands you’ve also probably never heard of (nor do I want to relive the disappointment of). But in 2018 we’re finally getting closer. Much, much closer. The Skydio R1 earlier this year was a huge step in that. But it came with a massive price tag and had inferior video quality (plus was cumbersome out on the trails). But this past August DJI launched the Mavic 2 series. Sure, it has tons of cool cinematic features, including a Hasselblad and zoom lens option. But I was most interested in the Active Track 2.0 aspects. 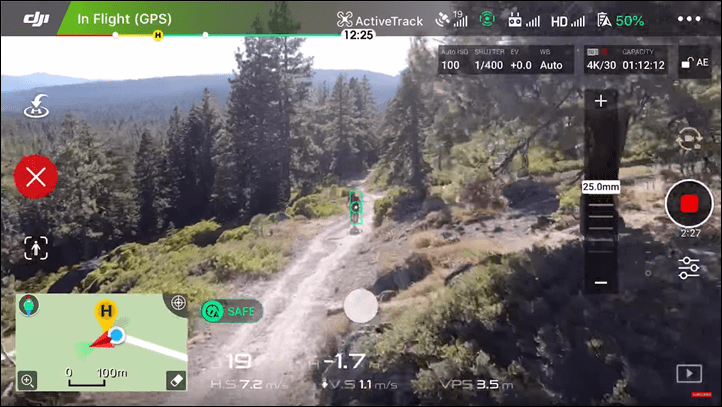 That would be DJI’s refreshed tracking technology that’s meant to autonomously fly the drone and track you doing cool stuff. Previously Active Track (1.0) was less than awesome for fast moving sports. Sure, it could kinda work in very limited scenarios. But more often than not you’d lose it. Or, it’d lose you. So I’ve been testing the Mavic 2 Pro and Zoom since late August, and finally here’s my in-depth review (as well as a bit of a long-term one). I’ve beat the crap out of these drones. 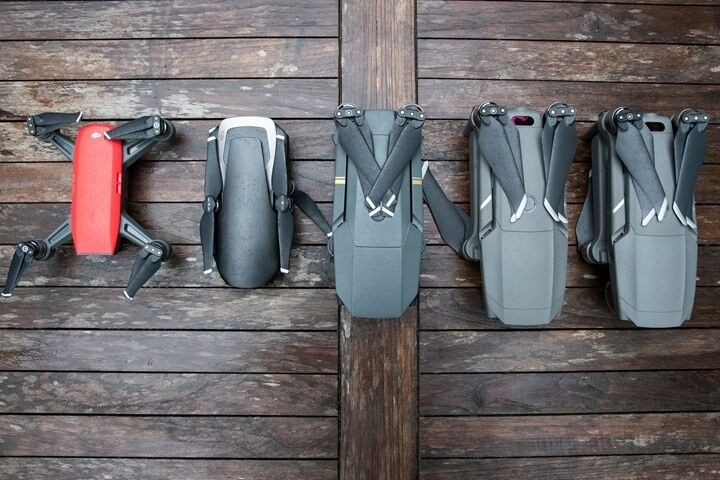 Taking them on more than a dozen flights in a soft-shell case, including six transatlantic flights. I’ve taken them to hot weather destinations, and frozen cold ones alike. High altitude, and sea level. In any case, once I’m done hitting publish, I’ll send these media loaner units back to DJI and decide whether I’m going to get my own. Until then – here’s my complete in-depth review. It’s heavily slanted towards sports, and if you want to just read about the sport pieces, hit up that section down below. With that – let’s begin. 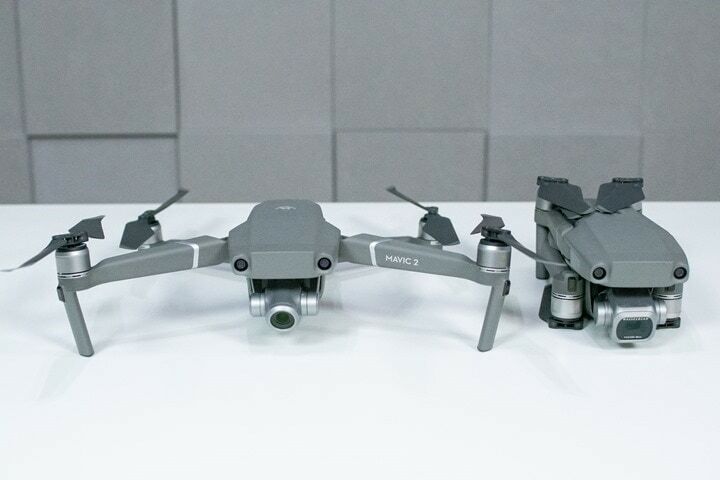 The first thing to understand about the DJI Mavic 2 is that it’s basically one aircraft with two dramatically different camera configurations. There’s the Pro and the Zoom, with the purposes of each exactly as the name implies. The Pro includes a Hasselblad branded 1” CMOS sensor at F2.8, while the Zoom version includes a zoom variant that’s got a 24-48mm optical zoom (plus 2X digital at 1080p). Unfortunately, you can’t switch cameras on them later on yourself in any supported/warrantied way (DJI has partially announced a service without any timeframes/prices/etc, so maybe down the road). So you’ve gotta decide upfront. 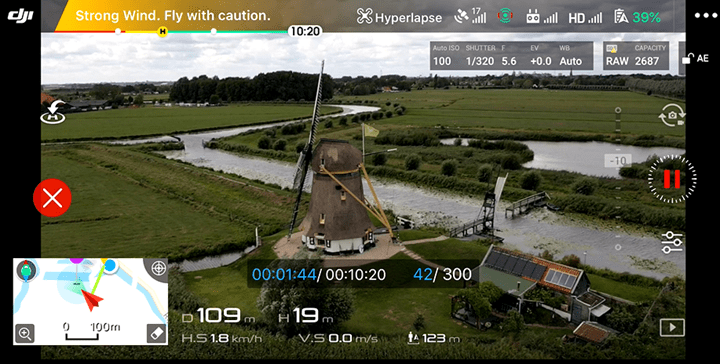 Pro/Zoom: First DJI product to utilize H.265 recording. In fact, HDR video requires it (and 10-Bit). 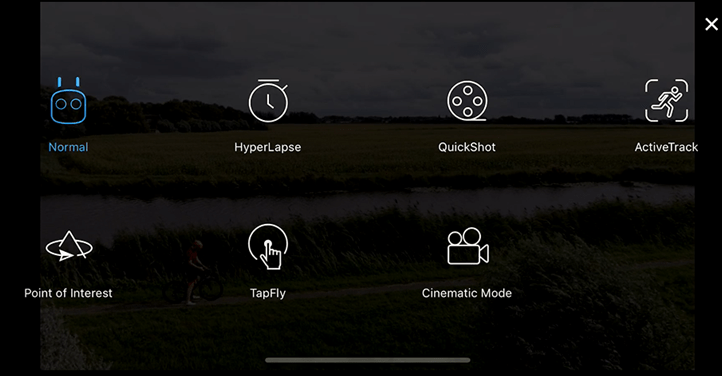 Pro/Zoom: New Hyperlapse Mode: Has 4.5 ways can be flown: Free, Circle, Course Lock, Waypoint, and then later this year a new saved task library. And finally, the prices for each are $1,249USD for the Zoom, and $1,449USD for the Pro. This is a notable increase in price comparative to when the original Mavic came out, which was $999. From an aircraft handling and battery/performance standpoint – both are identical (and I’ve validated this as well). Both get about 25-30 minutes of battery runtime, and both can clear speeds of 44MPH. 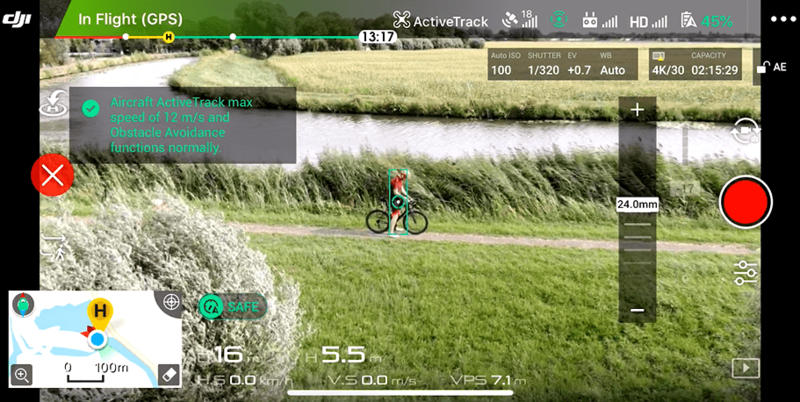 Both have additional proximity sensors on them to avoid flying into things, most notably on the top and rear, which the existing Mavic 1 lacked. The top-sensors are important because they keep your drone from flying upwards into trees. Historically speaking I’ve found that’s the single biggest crasher of drones, primarily in return to home type scenarios. Below you can see the downward facing sensors (left, flipped upside-down), and then the upwards facing sensors (right drone, towards back). 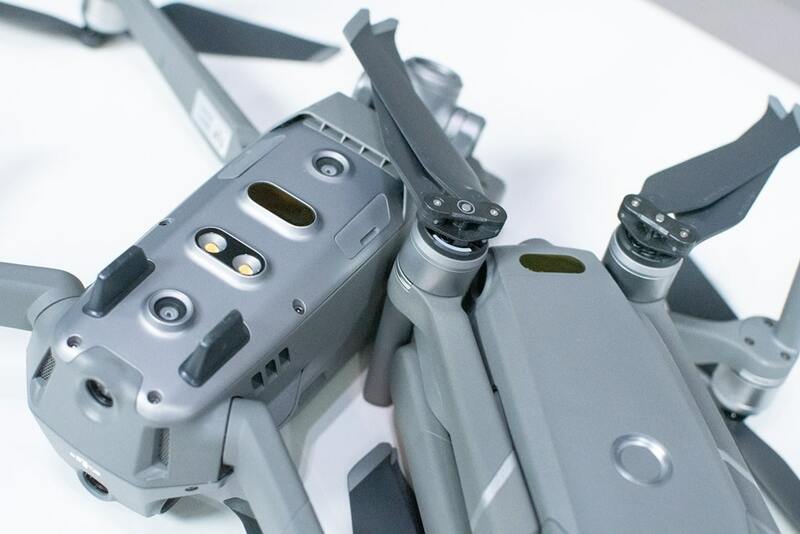 Both Mavic 2 units use the exact same batteries, which like almost all DJI drones doesn’t match any other drone or their predecessors (the exception being the Phantom series has mostly managed to keep the same batteries for a generation or two each). 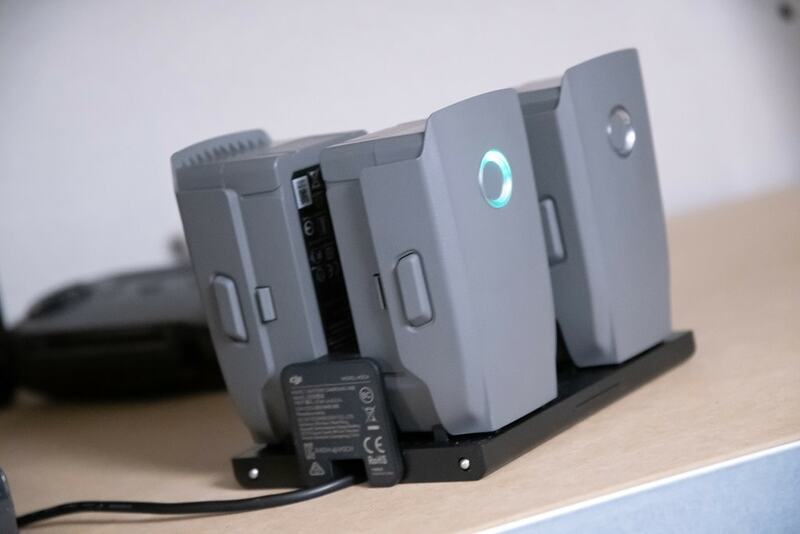 The batteries can be charged using the charging adapter that comes with it, or, if you by the Fly More Package, it includes a multi-battery charging station. Note that DJI got rid of combos of drones + extra accessories this time around. Instead, you purchase the two kits separately. Still, the DJI combos (Fly More Kits) are the singular case in the sports tech industry where I actually do recommend you buy the extra bit. 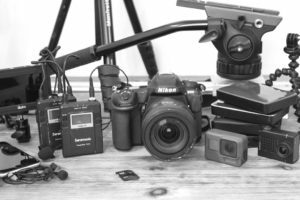 Having extra batteries is key to drone filming. Nothing is more frustrating than running out of batteries. 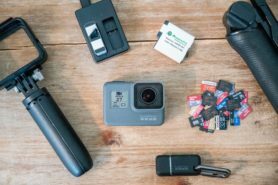 While having 25-30 minutes of flight time is actually a ton of filming capacity, you’ll still find cases where you wish you had more than a single battery’s worth. The combo pack comes with 2 additional batteries (the drone itself comes with one). The Mavic 2 includes a new controller, though it’s fairly similar to past DJI controllers physically. Additionally though they’ve switched things up a bit. For example, the new controller now does a 1080p live stream of the signal at up to 5 miles, versus only 1.25mi previously. Additionally, the new controller now will automatically download the full resolution photos to your phone in real-time, versus having to download them later (previously only lower-res versions were downloaded). The controller includes detachable joysticks, which can help protect it when you stash it deep inside that bag without any protection. Disappointingly though, you still can’t download wirelessly a 4K copy of the video, even after the aircraft is on the ground. 4K videos *must* be transferred via card or USB cable. And unlike a GoPro, you can’t even download a full-res 1080p copy from the 4K version either (meaning, it won’t transcode a copy for you). Why would you want to do that if it streams a 1080p copy in real-time? Well, that 1080p copy can be subject to signal/interference issues, so it’s not usually a perfect variant compared to the one recorded on the microSD card in the drone (or on the 8GB of internal storage). Ideally DJI would allow you to later download a transcoded 1080p copy. That’s handy when you’re not near a computer to download the full 4K variant. 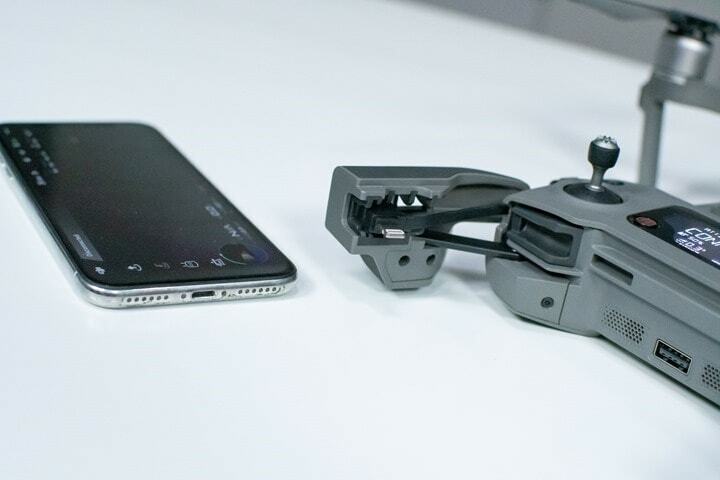 Next, note that unlike virtually all past DJI products, the Mavic 2 is one of the first units that does NOT allow you to use your phone alone to control it. Meaning that you must take and use your controller. Past DJI products allowed you to use either your phone or the controller. This was handy for cases where you didn’t need the full range of the controller, and you were fine with the 100-meter limitation of the phone signal. It was also ideal for sports tracking configurations, as you didn’t have to figure out where/how to mount the controller. The reason for this was a shift in the controller signal. But honestly, that’s a bit of a cop-out. 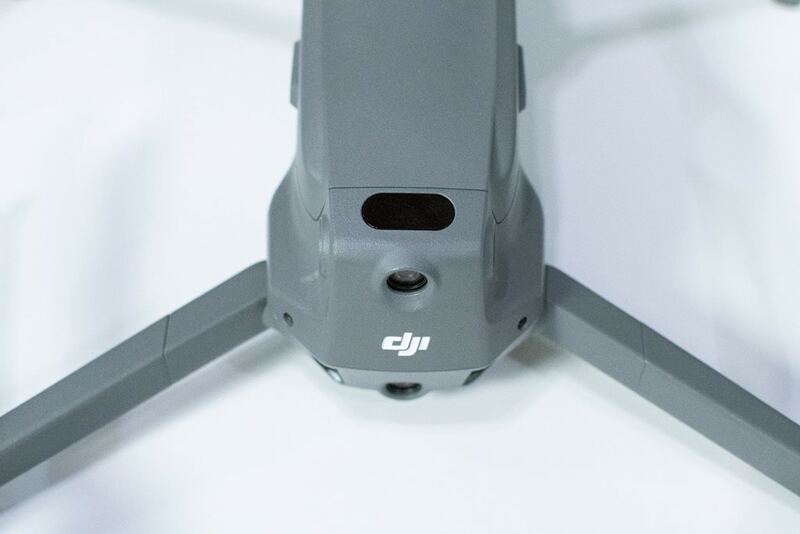 DJI always had dual-channel on the aircraft, and ultimately this is a significant reduction of a feature for those wanting to do sports (or just travelling a bit lighter). With all the overview bits out of the way, let’s quickly cover the basics of flying. Flying the DJI Mavic 2 is pretty much identical to past DJI drones. So if you’re familiar with that, you can more or less skip this section. But if not, then read on! Once that’s done you’ll press the button on top of the aircraft, which is on the battery. Press it once briefly and then long hold, which powers things up. The same is true of the power button on the remote control. Somewhere along the way you’ll also want to ensure you’ve got your phone attached to the remote controller with the small cable sticking out the side. The unit comes with cables for micro-USB, Apple Lightning, and USB-C. The holder won’t fit an iPad, but will fit most phones on the market. It even fits my iPhone X with a Quadlock case on it. The cable from the controller to the phone is what carries the video signal as well as other controls to the DJI GO 4 app. It’s also how images and videos are downloaded to your phone. The controller itself talks to the drone via wireless signal (not WiFi). That system is what DJI calls OcuSync, and the Mavic 2 uses OcuSync 2.0, which streams up to 5mi/8km with 1080p video. Control is capable beyond that distance, though video gets sketchy. Also, most places on earth restrict beyond line of sight, and nobody is seeing the Mavic 2 at that distance. The channel claims 120ms latency, as well as a 40mbps download speed – which is how it manages to download the original photos on the fly. 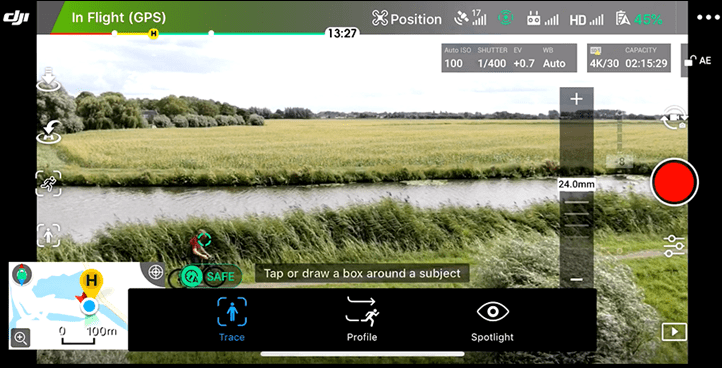 With all that settled you’ll now have the DJI Go 4 app showing you the camera view of the drone. You can take-off by pressing the buttons on the app screen, or by holding both joysticks inwards towards each other and down. 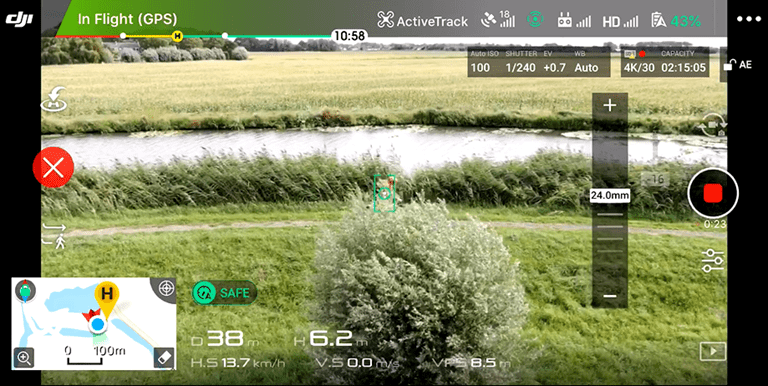 Just prior to take-off you’ll also get the home-point automatically set, in case you lose contact with the drone, it knows how to get back to you. The props will spin up, and then if commanded, take off and hover a few feet above the ground. From there you’ll fly your drone as you see fit. Which may sound like a simplification, but ultimately there are tons of resources for learning to fly a drone. 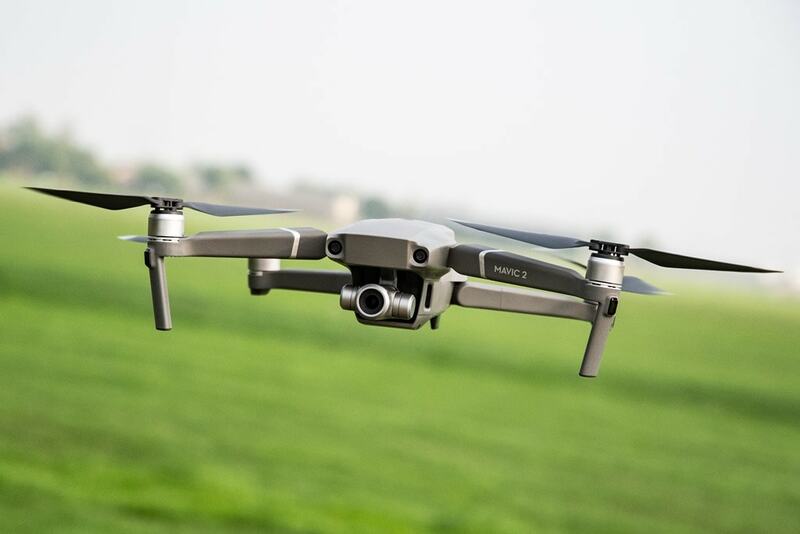 Flying the Mavic 2 is no different than any other DJI drone. It’s got various modes you can use depending on what you want to do and how much of a safety barrier you want. If you want to throw all caution to the wind, the fastest and most extreme mode is sport mode. Most of the time though you’ll be living in one of the regular modes, with whatever limitations you’ve specified in the app (such as max distance and altitude). In the event the drone loses connectivity to your controller, it’ll execute a ‘Return to home’ (RTH), which means that’ll ascend to a predetermined altitude (I usually set it to 50-meters), and then fly back to wherever it took off from. It’ll avoid any obstacles (such as trees) along the way. And the accuracy of that entire equation can be increased if you’ve enabled APAS. 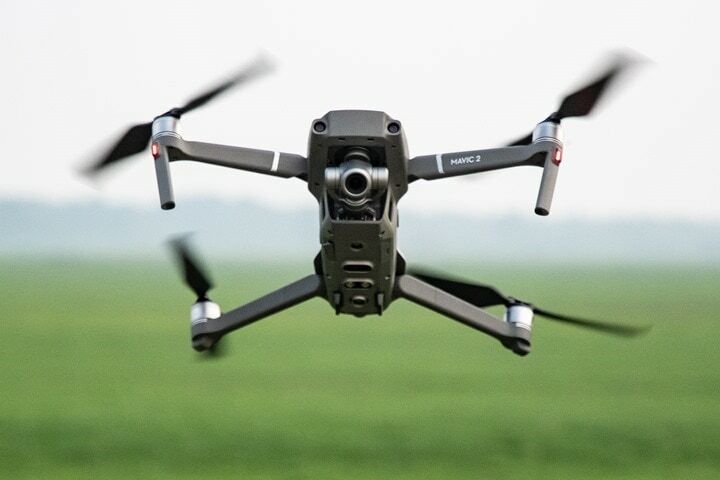 In fact, it’s the Mavic 2’s upwards facing optical object avoidance sensor that’s key to success on RTH here. Virtually all of my drone crashes have been due to return to home type scenarios where the drone flew upwards into a tree branch it couldn’t see. Note that the Mavic 2 contains a downwards facing LED light. This serves two purposes. First, it illuminates the ground which helps for landings at night. Second (and most importantly), it makes it easier to spot the drone in dusk/dark/night conditions. Setting aside any legal/rule aspects about flying at night, at least it’s more visible now. The settings are on/off/auto, so you can choose whichever you want. In the below photo the bright spot is coming from the LED light, which is considerably brighter than the smaller LED lights on the arms. Of course, most of what you want to do with a DJI drone is about taking photos and videos. So let’s head straight into the next section for that. I know, I know. You’re already asking: Zoom or Pro? Ok, with that out of the way, let’s talk about specs and such and then the newer features. As noted up above there’s two versions, the Zoom and the Pro. The Zoom includes the 24-48mm optical zoom lens, plus 2x digital zoom atop that for 1080p video (not 4K video). Meanwhile, the Pro gets the fabled Hasselblad sensor/camera plus the color science aspects from them. It also gets LOG recording too. The L1D-20c camera on the Pro is designed as a collaboration between Hasselblad and DJI (which DJI now has a large stake/share in). Though, I wouldn’t really overthink this aspect too much. At the end of the day this camera isn’t anywhere near the same levels as Hasselblad’s tens of thousands of dollars cameras. It’s mostly just clever branding/marketing. 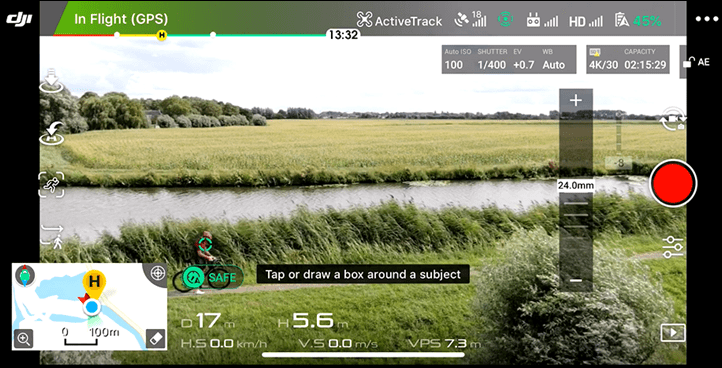 Meanwhile, the Zoom is more akin to past DJI drone’s cameras, except that you can zoom it using the wheel on the back of the drone (or a slider on the app). This allows you to appear closer to subjects, as well as achieve the much-vaunted dolly zoom effect where the drone physically moves back while the camera zooms in. You can do this manually yourself, or you can have the drone do it for you. Ok, now, let’s move on to the practical aspects of it all. I’ve shot a ton on both the Pro and the Zoom, including some side by side stuff. Out of the box, without doing color correction you’re unlikely to notice any differences between the two. 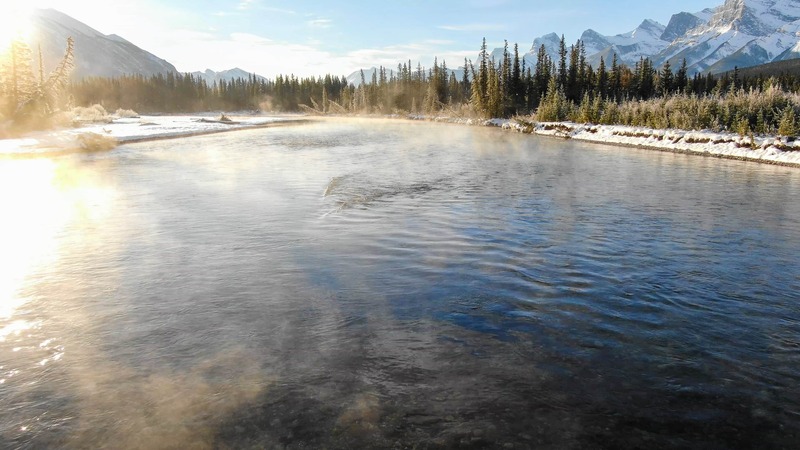 In certain settings where light and dynamic range is key, you’ll start to see it a little bit with HDR content – but even then it’s going to depend heavily on the exact lighting conditions. Do note that on the Pro specifically, some of the new recording rates require H.265. These days (late 2018), that’s not really a problem. Both Windows and Mac support it natively for at least the last 12-18 months, and Final Cut Pro and Premier also support it. However, if editing in other apps, double-check that it does support H.265 recordings, as some older apps don’t. Shifting slightly, the entire point of the Dlog recording on the Mavic 2 Pro is all about post-production color correction. If you have zero plans to do that (or if you don’t know what that is, then just move straight to the Zoom. Seriously, it’s not worth it. Of course, there is some incredible stuff you can do with the Pro. this video from a filmmaker and someone good with color correction really nails it. But, executing that also takes a boatload of time. Below you can see the recording setting for an HLG video and also note the required H.265 video config. this is at 4K/30. For me, I’ve been blown away by the Zoom, because it gets me closer to the action. Remember, I’m all about sports action – and the Zoom allows me (in 4K) to basically double my focal length. I can double that yet again if I want to step down to 1080p (but let’s not get crazy here). To me, that’s more valuable. I can great more epic shots with zooming in, and sweeping maneuverers that zoom out to reveal something than I can with correcting color in post to match a specific cinematic move. One only need to look at the intro montage of either of my two of DJI Mavic 2 videos in this post to see that (all of which was done on the Mavic 2 Zoom). You’ve still got all the other stitched photo modes as well on the Mavic 2 Pro, but only the zoom can do the super high-resolution variant. 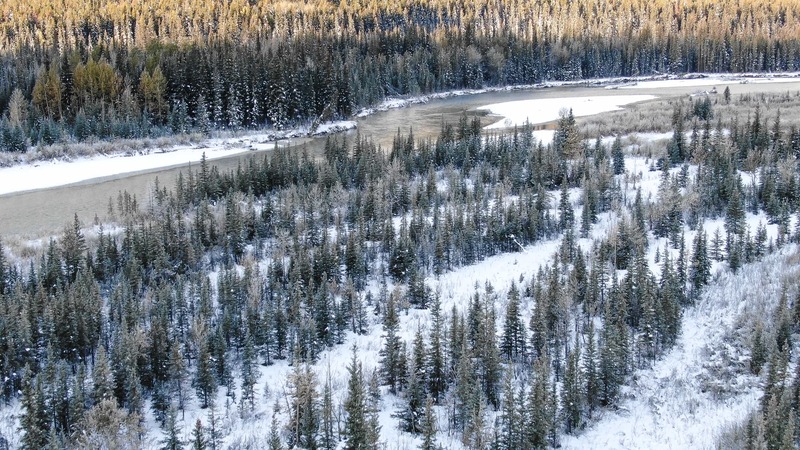 The Mavic 2 Zoom also includes the Dolly Zoom (vertigo-style) effect. The singular disappointment of the Mavic 2 series (well, aside from the fact that I can’t just swap cameras in any supportable/legit way), is the lack of 4K/60. Given this came out on the DJI Phantom 4 series almost two years ago, it’s bizarre that DJI didn’t include it on the Mavic 2 units. The inclusion of 4K/60 is great for slowing down footage and still making it smooth. Sensor pipeline wise it would have been trivial to do (4K/60 sensors in action cameras have been available for almost three years now), so I suspect it was mostly a marketing decision to protect the Phantom series. From a video and photo standpoint things, things have been solid for me. Same goes for the gimbal – I’ve seen zero gimbal issues, even in pretty high winds that I operated in a few times. Of course, a big part of any drone is how stable it is. As well as whether it hits various performance specs such as battery life. These days that’s frankly less of an issue than things would have been just a few years ago. Still, stability of the aircraft and the ability to hold position precisely is crucial to that. 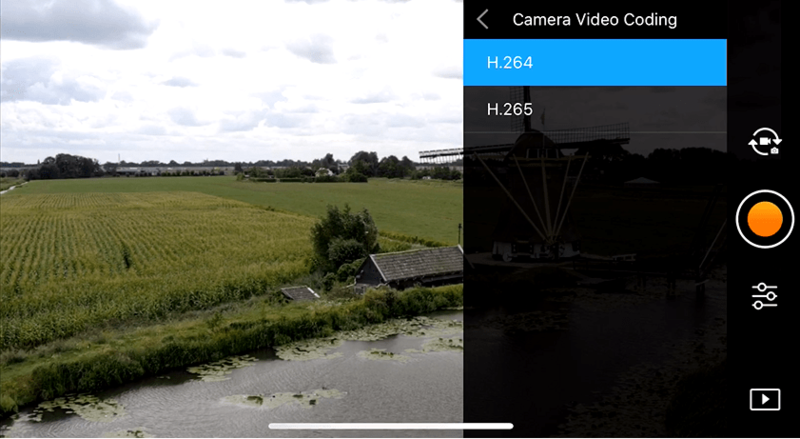 It may sound silly – but in light of specific new features on the Mavic 2 such as Hyperlapse and zoomed in 48MP stitched panos, it’s critical. If there’s undesired movement in the aircraft, those photo and video features start to fall apart. Even non-video/photo tasks like flying through tight spaces become challenging if an aircraft can’t stay put. 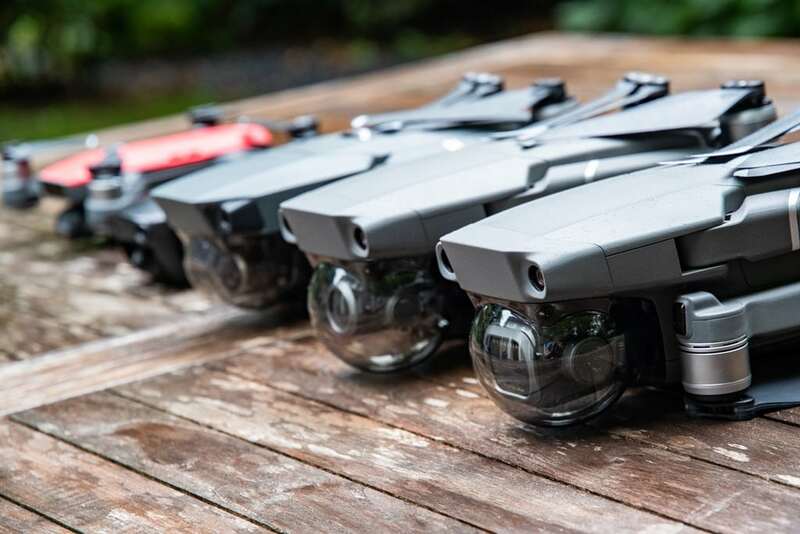 The Mavic 2 employs a pile of sensors to help it stay put, which results in slightly varying results depending on where it is. When it’s closer to the ground (within 11m for precision movements, but detects ground at 22m), it’ll use its downwards optical and ground detection sensors to hold position. The ground detection sensors are utilized to determine exactly how far away from the ground it is. This allows for near-perfect automated landings (whereas drones that don’t have this tend to do automatic landings with a cringe-worthy thunk). In addition, the ground sensors in conjunction with the optical sensors are actually used to hold position during steady-state flying as well. For example, let’s say you start your drone off at eye level near you. It’s not actually leveraging GPS heavily at this point. It’s purely using the array of near-field sensors to stay put. In 99% of scenarios this works really well, however, you do need to be slightly more careful over water or glass, both of which reflect and can confuse the drone a bit since the surface its tracking is effectively changing in its eyes. In all my tests, the Mavic 2 has done mostly fairly well for placement/position holding. This has meant that Hyperlapse and panos mostly work well. I say ‘mostly’ though, because there has been an exception. I tried to do a Hyperlapse around an object on a windy day, and the result was poor at best. 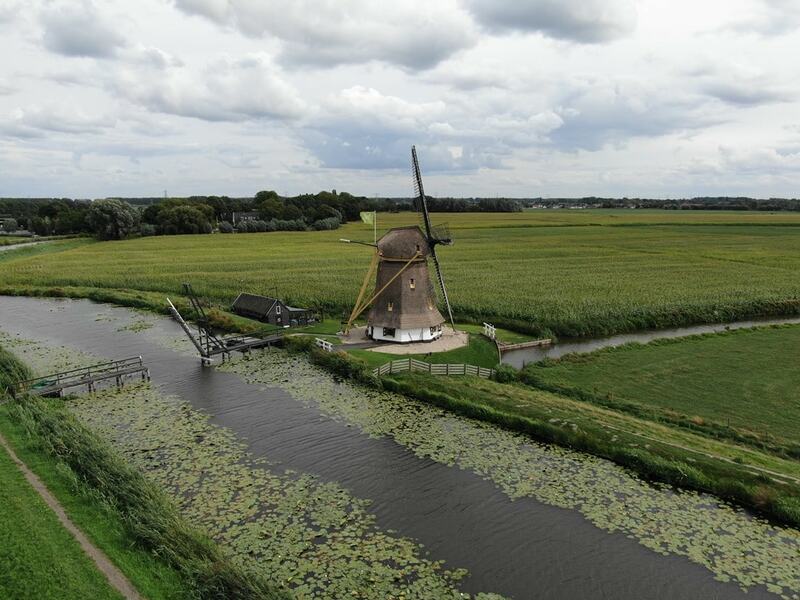 To a bystander on the ground, the Mavic 2 certainly might have appeared to hold position correctly – but once up in the air the variances in positions were extremely noticeable as it was no longer a smooth Hyperlapse, but a jumpy one with different radius and altitudes. Certainly this is an edge case, and partially because I was executing a Hyperlapse around an object – which means that shifts in either radius to the object or elevation are immediately apparent once sped up. Whereas a more traditional Hyperlapse in a forward direction over a landscape isn’t as obvious because you aren’t keeping a specific object in one point and time. For example, looking at the below screenshot you can see the higher wind warnings (which is fair), and the Hyperlapse timers at the bottom. This shot ended up being pretty poor. And finally – speed. The Mavic 2 claims a top-speed of 44MPH, slightly above that of the Mavic Pro. Testing it is always a bit tricky as it depends on wind conditions. If you’ve got a tailwind you can easily go above it, and of course a headwind will keep you from reaching it. Plus of course being in the correct mode. In my testing I was able to get pretty close to the top speed, which is reasonable enough for me. Frankly, top-speed is almost never a consideration for my specific use cases. The only time I find it useful is actually just getting the aircraft back to me if it’s a ways away. But even then most of what I do tends to be closer-range at more human-powered speeds (rather than automotive, etc…). The same mostly applies to distance/range. Testing the max range of this aircraft isn’t my cup of tea. There’s places on the interweb you can find that people will see how far it goes, but for the countries I live in and travel – doing so would be against various rules. What I care about more is whether it drops signal at any closer specified ranges. In my case I had no issues with that. 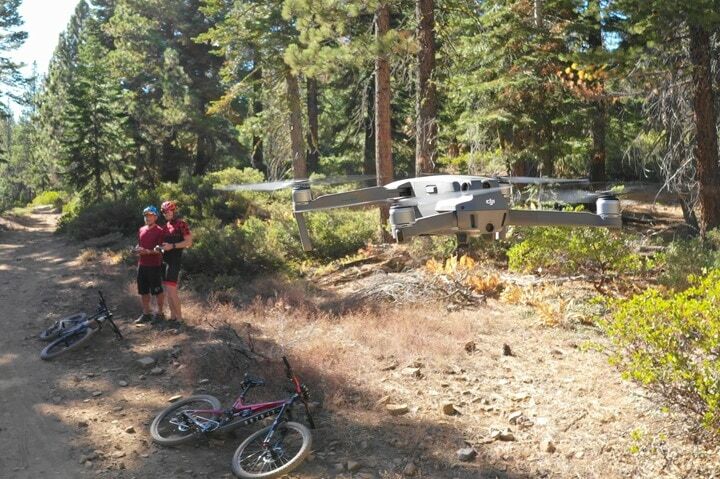 Of course – the main reason I review drones is for the sport side of things. 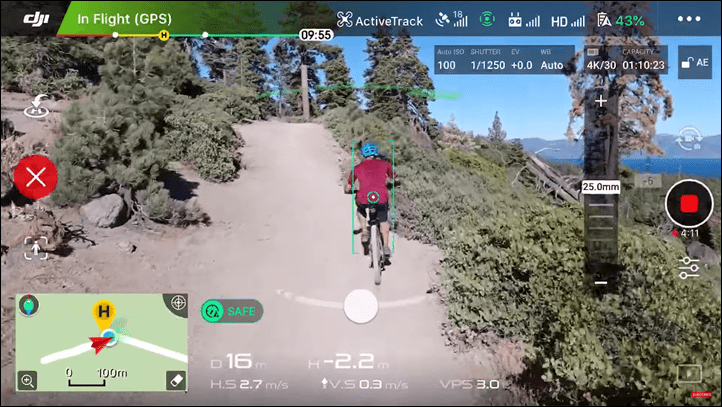 And I was keenly interested in whether or not the DJI Mavic 2 would stand up to DJI’s claims of increased sport tracking via the new Active Track 2.0 that debuted on the Mavic 2 series. 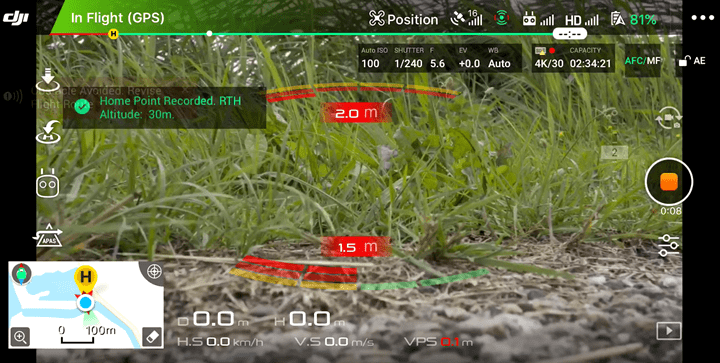 This new Active Track variant stated it would be able to predict where the user was going for up to three seconds in advance – allowing it to better figure out what happens when a person/object goes out of view, such as behind a tree or such (briefly ideally). 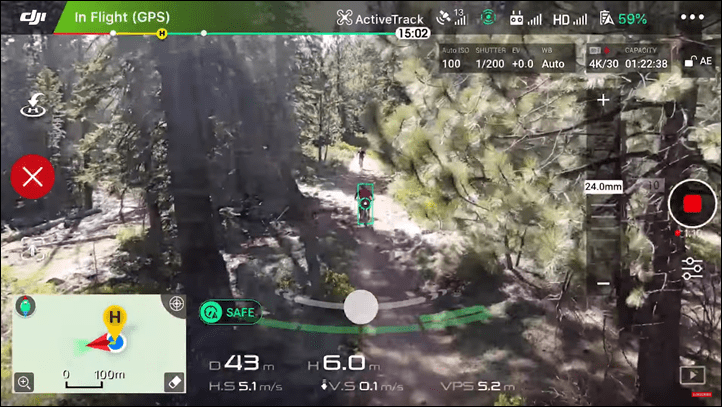 Previously on past DJI drones, I’ve found the Active Track feature more a gimmick than useful. Sure, it could track a person walking around an empty football field, but add in even the slightest bit of complexity and it usually fell apart. The best I was able to do previously was it tracking on open roads a road cyclist. Even a single tree would usually uncouple things. The second video I did as a collaboration with Desfit. In this case, we set up all the tests together and acted as each others safety pilot (for the first test, I had The Girl act as the safety). In the below video, Des also got the ‘privilege’ of editing the video. But this second one focuses on mountain biking and in particular going up/down various grades as well as tracking through trees. Oh, and we even threw down with two-person tracking too. Seriously, it’s impressive. Additionally, you can disable Active Track safe mode, which essentially limits the speed it’ll track you to 12 meters/second. With this disabled it’ll track you as fast as the drone can go. 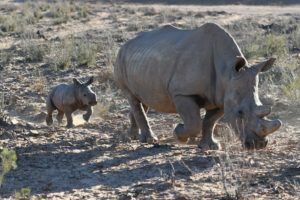 But that also means you run the risk of outpacing the optical object avoidance sensors, which won’t be able to react as fast at the speed limits. For most running/cycling/skiing things, you’ll be more than fine with the regular safe variant. The non-safe variant would be more applicable to motorized sports (or skiing a bit faster). After selecting a mode the camera starts looking for objects. These include things like people and cars primarily. If it finds an object it’ll go ahead and show little circles atop things it finds. You’ll get multiple circles if you’ve got multiple trackable objects. To start tracking an object, simply tap the circle, which adds a rectangle around the object. It’s now tracking you. At this point you can go off and do whatever activity you want, and it’ll keep tracking you as long as you haven’t gone too fast for it, or gone behind trees/shrubberies/polar bears too long. You can use the controller to change the position relative to you, as well as how far away it is from you. This doesn’t change the tracking of you, but rather where the camera (drone) is. This is useful for creating super-cool sweeping effects as you track someone. You can see this in my first Active Track video above at the intro section. The little dot towards the bottom of the screen allows you to sweep the camera left and right, depending on the mode. Note that if you’ve got the Mavic 2 Zoom, you can also adjust the zoom as normal using the little wheel on the controller or the screen. All other camera controls are also available. You can see below it shows at 27.0mm (that’s the zoom). 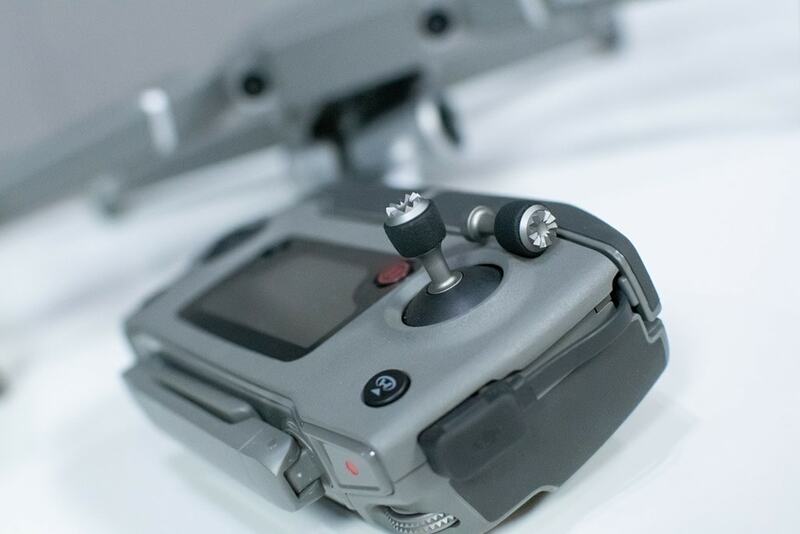 Speaking of controls – one of the big challenges of the DJI Mavic 2 is that you are required to use the physical remote controller. 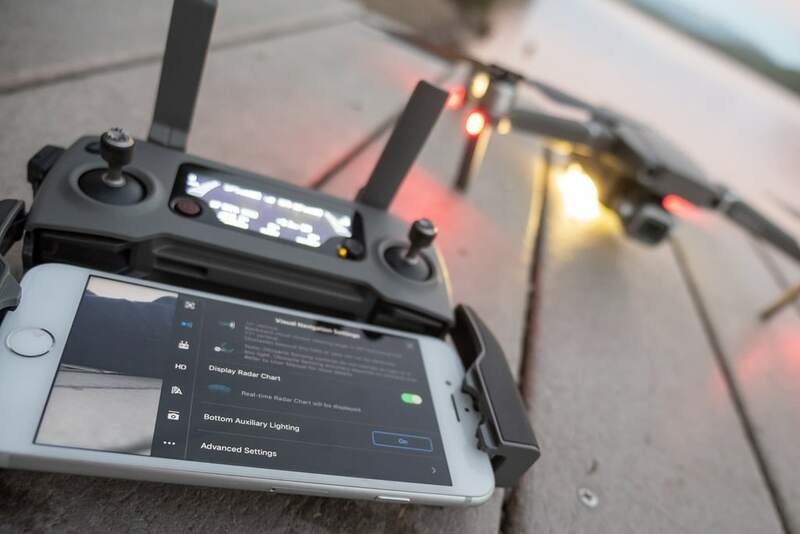 Previously on virtually all DJI consumer-level products you could control the drone with your phone instead of the controller. So a direct WiFi connection from your phone to drone. This was ideal for sports tracking because the Active Tracking wasn’t useful beyond 100m, and it means you could conceal the phone a bit better. 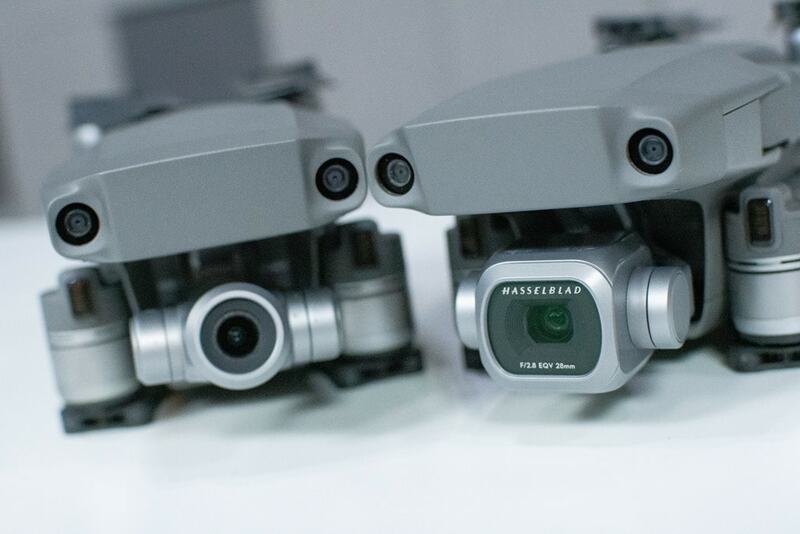 Whereas the Mavic 2 requires both be paired together and connected at all times. For cycling, this makes things a bit trickier. What I did in my case was use a Quadlock case along with some heavy duty rubber bands (from the Garmin Edge mounts, if you’re familiar). The phone is connected to the Quadlock case/mount system, and then the controller in turn connected to the phone and re-enforced using the bands. From a tree avoidance tracking standpoint, it handles pretty well. You can see this in the video where I dip behind trees for a second or so and it finds me each time. Though, you can see the hesitation as well. Where it tends to get in trouble though is if it gets in front of you for some reason (such as in profile mode when you change direction). It’ll track just fine from in front, but if you go too fast for it or if it has to avoid an obstacle it’ll usually lose you as it slows down and you go under it. Next, what about elevation gain/descent? Well, in previous Active Track 1.0 versions this would basically crap itself in one of two ways. The first way while descending is that the drone would stay at whatever altitude you started at. So let’s pretend you were at the top of a hill (altitude: 300-meters). As you descended down the hill, the aircraft would stay at 300m like a flat line. Whereas you’d eventually descend out of range. The next challenge was the inverse. During Active Track ascending it’d also stay flat and eventually hit the ground (or stop because of object avoidance). DJI aimed to resolve that down the road, but not for the original Mavic series. Finally – what about multiple objects/riders in the frame? 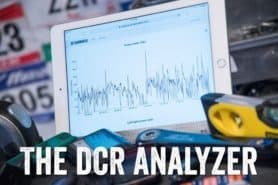 Can it track the right person? We tried testing that too. We put both drones in the air, and then both of us were on bikes. Each drone was assigned one of us to follow, and we started a few meters apart initially – and we staggered the two elevations slightly. The drones easily had both of us in view the entire time and saw both of us as valid objects to track. Oh, and we did this in the woods on trails too. Overall, this worked surprisingly well. Neither drone mixed up either of us for the other. And both drones tracked the right person through to completion. Now, we weren’t going super fast on this section, but still, it’s promising. I will point out though that as you saw in the first video, Active Track 2.0 is hardly perfect. There are still cases where it’ll lose you. It’s not difficult to lose it cycling. However, the more time you spend with it, the more you understand how it works and how to finesse the best results from it. No sudden turns or sudden speed shifts. Keep things gradual, and aim to minimize the number of things that can get in the way. Fast speed by itself isn’t an issue, but the shifts in speed can be. 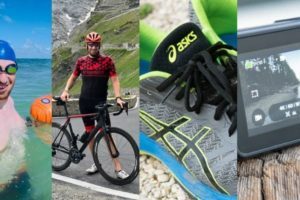 So overall – where does Active Track 2.0 stand? Without question it’s a hell of a lot better. Previously I couldn’t really use DJI drones in Active Track for solo sport tracking. Sure, maybe for a quick 5-second shot – but rarely much longer. They were basically quick b-roll segments that I’d be able to string together. Between the poor tracking of the object and the lack of true obstacle avoidance, previous DJI drones just weren’t practical here. 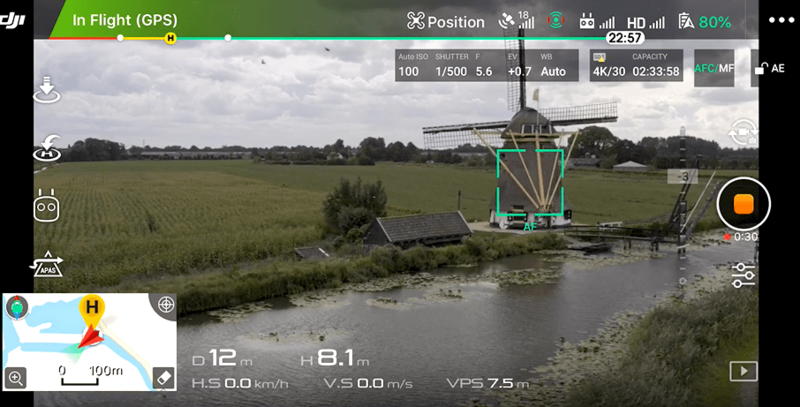 But with the near-360° object avoidance, including the critical upwards direction – it’s finally practical to use the Mavic 2 in certain situations. Which situations would I say it’d work fine it? There are certainly more scenarios than this – but this is sorta a starting point to think of. 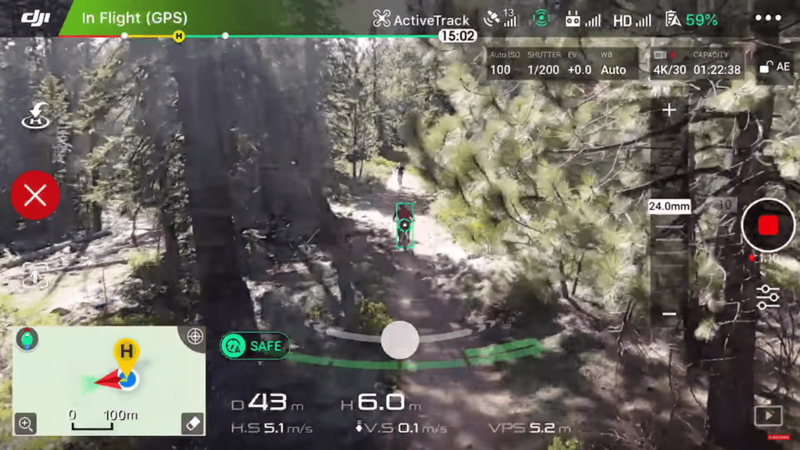 Of course, as good as the DJI Mavic 2 is for sport tracking, there’s still plenty of room for improvement. The current king of sport tracking is the Skydio R1, which contains 13 cameras, 12 of which are for tracking you as an object. It doesn’t require a dedicated remote and it’s really darn hard to lose. But that drone has poor image quality compared to the DJI Mavic 2 (it’s not even close), and only has half the battery. Plus, the Skydio R1 is a beast size-wise – it’s dramatically larger and only fits into certain large backpacks. Whereas the Mavic 2 fits into my back cycling jersey pocket. 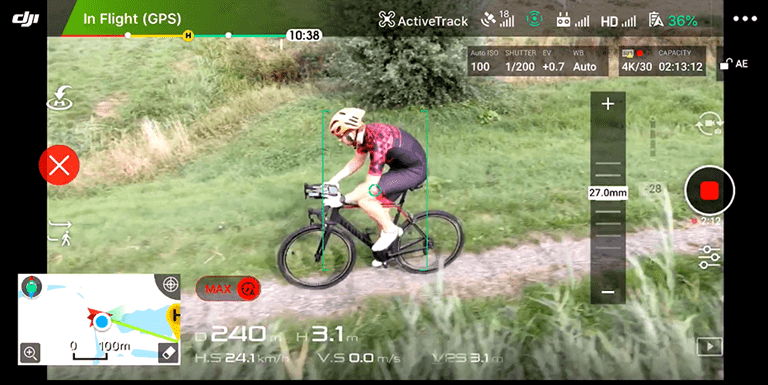 So, as it stands today – the Mavic 2 is the best option for sport tracking that still fits in your back cycling jersey pocket or similar size. I don’t see that changing anytime soon. I’ve added the Mavic 2 into the product comparison database, which lets you compare it against other drones I’ve reviewed or have on-hand. These days, that’s mostly DJI drones, because frankly – that’s what 99% of people purchase and are interested in. Most other companies simply can’t compete anymore. 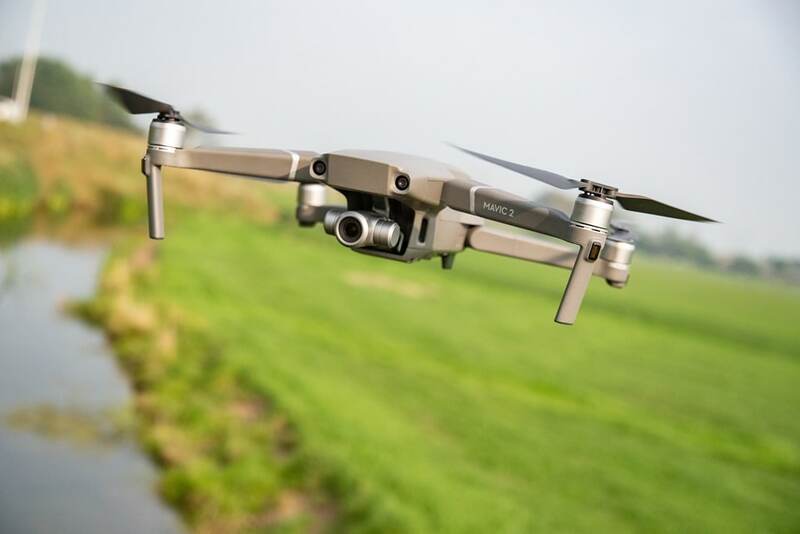 For most consumers it’s not really a question of whether to get a DJI drone or a competitor’s, but rather, which DJI drone to get (save specific edge cases). 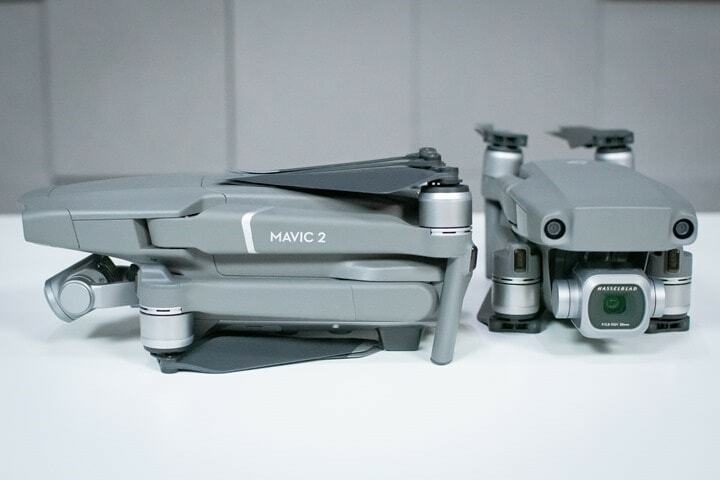 In any case, here’s how the Mavic 2 compares against the DJI Mavic Air (my favorite) and the DJI Spark (also a huge fav of mine). So, what do I recommend between the three? It’ll simply depend on what you want out of the drone. If you don’t care about 4K video – then my answer is swift and clear: The DJI Spark. Seriously, it’s an incredible drone – and one that shares the same camera as the original 4K-equipped DJI Mavic, it’s just that they use that 4K camera resolution to do stabilization. All you need to know is the results are stunning. 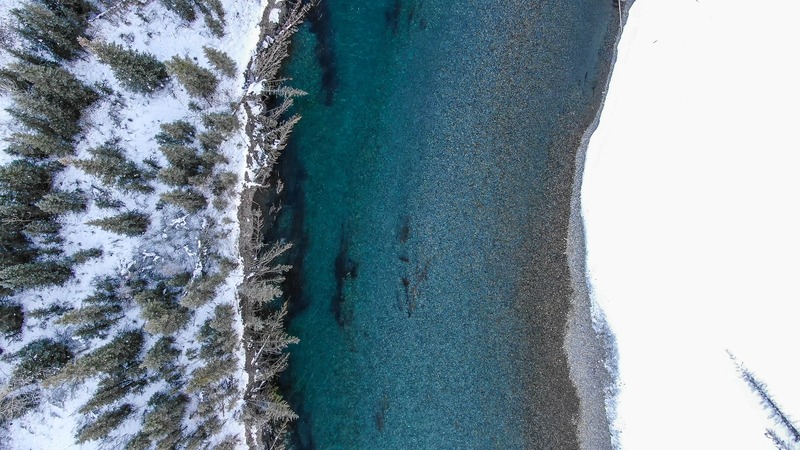 I can guarantee you that if I showed you typical 1080p footage (unedited) from a Mavic 2 and Spark without labeling them, you wouldn’t be able to tell the difference nor identify which was which. Where you can get into scenarios that the Mavic 2 excels at is when you do get deeper into editing. 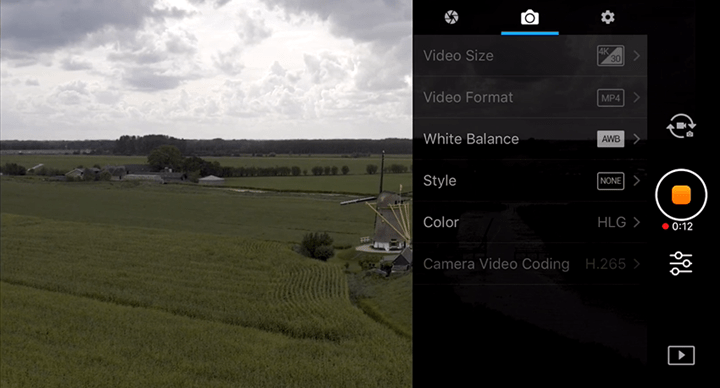 If you’re planning on color grading or doing other more in-depth tweaking of the image, then having the additional capabilities of the Mavic 2 (Pro or Zoom, but especially Pro), can be useful. Important even. But 98% of people uploading to YouTube aren’t color grading. It takes a lot of effort and knowledge to do right. So then, why’s the Mavic Air my favorite? Well, simply put – it’s smaller than the Mavic 2, but still has 4K. I like to shoot everything in 4K because…well…I’m probably a video snob. In actuality, it gets me room to zoom in and crop within the frame. As nice as the Mavic 2 is (and the Zoom would address my zoom/crop comment), the size is more substantial than the Mavic Air. As is the weight. Additionally, one of the things I really like doing on both vacations and rides is *not* taking the DJI remote. I rather just use my phone for quick social-media type shots. Such as this or this or this. All taken on the DJI Mavic Air and all with just my cell phone as the controller. The Mavic 2 doesn’t allow that setup anymore. And that’s a shame. Finally, there’s a DJI event scheduled next Wednesday (Nov 28th, 2018). The current rumors place a DJI Phantom 5 and potentially a smaller gimbal on the table (the gimbal could be super interesting to me). I started off as a DJI Phantom person – and then eventually migrated to the Mavic series, and now the Mavic Air. The Mavic, of course, is smaller, and as of late it’s basically one-upped the Phantom series in almost every respect (except the 4K/60 and slightly bigger battery). The current rumors point to an interchangeable lens system for the Phantom 5, which make it closer to the higher level Inspire series. The same rumors also point to a higher price tag than ever before, which is probably fair given the features will nearly match that of the Inspire 1 series (save redundancy aspects). Note that while some will say that the Phantom series is “more stable in wind”, as I’ve proven over and over and over again with every DJI drone, there’s no basis for that. No amount of wind is an issue for any of these units, even the Spark or Mavic series. Instead, the main reason to get the Phantom series is purely video aspects (or potentially if frequently launching from a boat, due to being slightly easier to hand-launch in rocking conditions). But ultimately – you won’t go wrong with any of these choices. They’re all incredible drones. There’s no question that the Mavic 2 series is the best small drone that DJI has ever made. That part’s not really debatable. It’s got incredible specs packed into a relatively small form factor. The zoom aspects of the Mavic 2 Zoom is a welcomed edition, though, like everyone else I wish I had the option to swap cameras between the two editions. I’d likely end up buying both cameras and use them like accessories. Though, I suppose that’s probably what DJI wants for the Phantom 5 series. From a sports standpoint, Active Track 2.0 is a huge upgrade over Active Track 1.0. But leaving it at that wouldn’t be telling the whole story. That’d be giving Active Track 1.0 too much credit. It was generally pretty useless for most sport tracking, whereas as Active Tracking 2.0 gets closer. It’s now in the ‘might work most of the time’ category. But definitely not yet ‘will absolutely always work’ range. And while the current king of sports tracking is Skydio with the R1, even that doesn’t approach the ‘will absolutely always work’ aspect. DJI could get there. All it would take would be releasing a small tracker transmission pod equivalent to what AirDog and Staaker have. 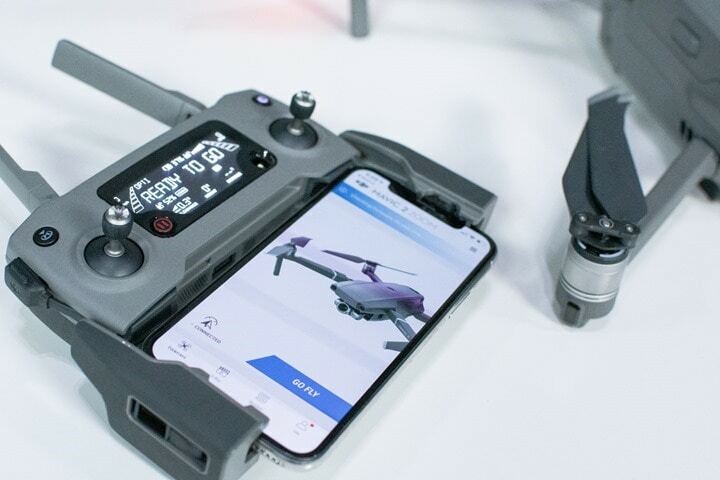 I’d buy that immediately – heck, even if it were $500 (as long as it worked with all current generation DJI drones). That would allow one to take advantage of DJI’s obstacle avoidance capabilities while ensuring the drone didn’t lose us. I’ve yet to understand why DJI resists this so much, since they make accessories for all sorts of other silly thigs. One day perhaps, one day. 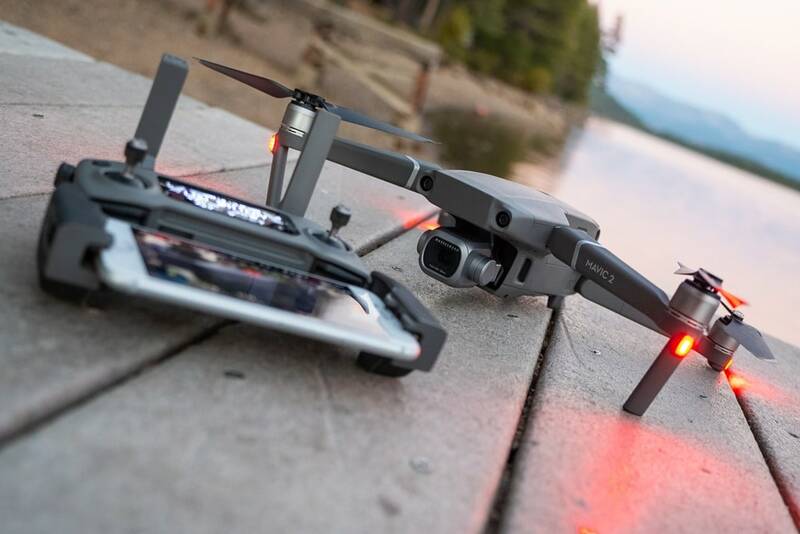 Until that day though – the Mavic 2 represents the best blend sports tracking and all-around cinematography drone. Will it replace my Mavic Air as my go-to drone? Probably not. Not because there’s anything fundamentally wrong with the Mavic 2, but because I just bought the Mavic Air this past spring and it works great for what I want. Had the Mavic 2 included the ability to control it via phone-only (as well), then I might be a buyer. If you’re a fan of Amazon, you can pick up the DJI Mavic 2 that way and it helps support the site! It doesn’t cost you anything extra, yet helps here a bunch. If you’re outside the US, it should automatically find the right Amazon country for you – but you can always use the big Amazon country links on the right sidebar if so! Oh, and in the future if you just click that Amazon logo before buying anything else (like laundry detergent or toilet paper), that supports the site too! Loved this sentence: “Not because there’s anything fundamentally drone with “…. After typing “drone” 70-something times, I can image how it got there. I drone know what you’re talking about. I watched your DJI reviews before but this summary comes just as I was actually hunting for a drone for my skiing holiday. Thanks to this review I think I am going to go with the DJI Mavic 2 Zoom! How do you mount the Edge to the Handelbar ? 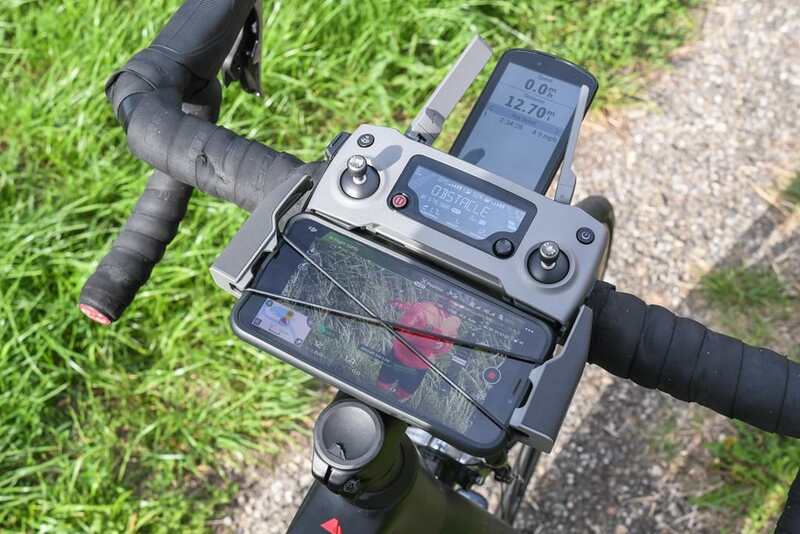 In my case I use Garmin’s mount for the Edge and the quadlock for the phone but the Edge gets into the way. I need to remove it in the phone/controller setting. I use the out-front mount for the Edge, in this case the Barfly Pro 4 one, which lower it down a bit. And then I use the Quadlock for the phone, and the controller attached to that. It all kinda works together (you can see it in the pic above). Thank you. Excellent review as usual. I have a completely different recommendation based on my experience. I had a mavic 2 zoom and I honestly didn’t use the zoom much. Perhaps due to my inexperience with zoom and video recording. I also will say that photos weren’t as impressive either. Especially in low light situations so photographers keep that in mind. So after that trip I returned the zoom for the pro 2 and I’m blown away by the video quality and the photo stills. Yeah, it looks like in that video the auto exposure was all over the place (causing that darkening in some cases). You can lock AE which helps with that. It’s also super silly easy to accidentally toggle on/off (I’ve done it countless times on past DJI drones and then swore at myself later when I realized it). Hi Ray! 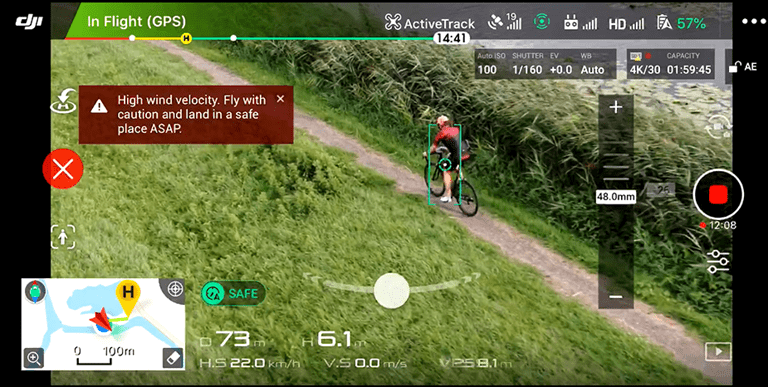 Is Active Track 2.0 available on the Mavic Air or is it useless at that compared to the Pro? Unfortunately not on the Mavic Air. I suspect partially because of the lack of additional sensors, and partially just because they don’t want to port the software. 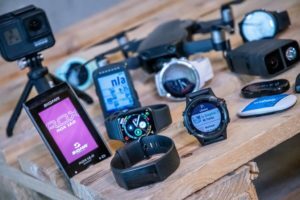 Nice article, just wanted to say 1 thing regarding the fact that you can’t swap camera with the mavic 2 because I’ve a lots people now that they done it and doesn’t look very difficult to me eyther. Yeah, I’ll clarify a bit. But the challenge there is that DJI doesn’t tell the cameras, and the service they sorta announced isn’t online yet with no date or pricing when it might be. Great review! I love the quality of the Mavic 2 Pro but just miss that extra bit of portability with the Mavic Air. A couple of things – the Mavic Air comes with the small case and controller if you order the Mavic Air without the Fly More Combo. You mentioned in the comparison that both only come with the combo. With DHP, it would really be perfect! Nothing I’ve heard of unfortunately. Sometimes DJI is funny. They won’t update things for a long while, and then, BAM, they do. My family would like to take a group photo while we are gathered for Christmas. In my internet research it looks like the gesture mode has been take away from the mavic 2 pro? Is there an alternative that I could do to get stills of a group of people without an operator (i.e., group selfie)? 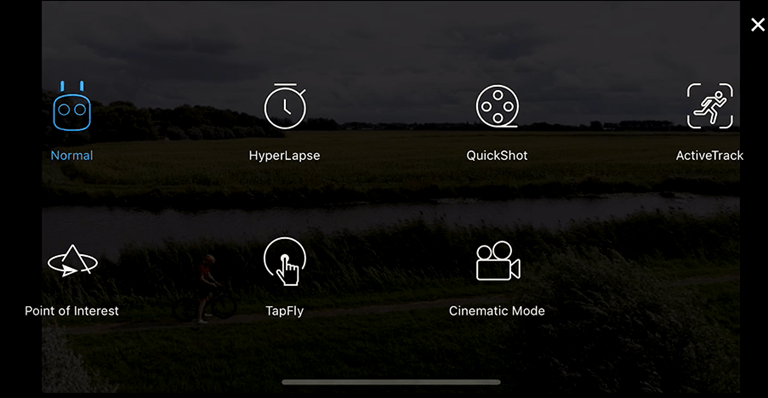 Can I use hyperlapse with some sort of intervals and just download the stills? Is there a better way to do this with the Mavic 2 Pro? Thanks in advance. I have a question about the active track during skiing and the place to store the controller.. I mean is there any lock option on the controller so as to put it safely in the backpack and keep going to the slop while the Mavic zoom keep following me? Ray, will we see a review of DJI Osmo Pocket or any other gimbals from you? Thanks! Definitely a Pocket review coming up. Been using it quite a bit lately. 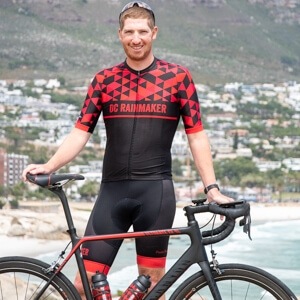 I want to get down to Cape Town next weekend (10 days away) though and throw it through the mountain-bike ringer first, so just after I get that knocked out. Looking forward to the Osmo Pocket review. Since you didn’t purchase the Mavic 2 but if you do, I would love to see a review of the Smart Controller that DJI just introduced. Hi there! great review as always – how do mavic air and the new drones compare in terms of sports tracking? Is the difference not material in your view as you’re voting for mavic air? It’s pretty significant actually in terms of how well it stays with you. It’s just that IMHO neither are super-ideal as all-around ‘will always follow you no matter what’ – so in that sense for me personally I rather just use the Mavic Air which I already own (vs $1,500 for something new) for capturing more still shots and stuff where I set them up. But if you didn’t own the Air and you wanted a drone to follow you Mountian biking, hiking and to take some fun shots of family on vacation would it be the Pro 2 or Zoom? I can’t decide if for these purposes if I’m better off with the better camera in the Pro 2 or the zoom for some neat zoom shots. Normally your reviews make it easy to decide, but in this case I know so much about the drones that I can’t decide! Or maybe I save some cash with the Air and wait for next year and hope the mavic 3 has way better sports track….AHHHHH…what to do!? Yeah, it probably would be – likely the Zoom over Pro. The thing is that unless you’re legit going to spend time color grading (and know how to do that), you won’t leverage what the Pro is giving you. And frankly, you won’t notice the quality differences either (well, 99.99% won’t notice). But, you get the zoom bits – which is huge in sports because it allows you to fake getting closer to the action without taking a hit on resolution. That’s the direction I was headed, but thanks for the confirmation! No buyers remorse for me now. Also gonna use it on summer hikes this year, hopefully I’ll get some cool shots of me and the boys using the zoom features. Thanks, I never buy anything without checking your site first, I appreciate the effort you put into this! I’m about to finally pull the trigger on the Pro 2 or the zoom…what is the release cycle? Is it worth waiting 4-6 months to get the newest mavic? I wouldn’t expect a replacement for the Pro 2 anytime soon. Generally speaking DJI operates on about a 1-2 year release cycle, whereby if at the 1-year mark it’s usually a small variant (like we saw with different props or other minor tweaks), and the 2-year cycle it’s a major variant (like we saw this past August). We have seen DJI start to offer totally different products by the same brand – which is how we got the mid-cycle DJI Mavic Air or even DJI Spark. Finally, generally speaking DJI tends to release some new consumer drone between the January and April time each year. My bet would be on either a slightly refreshed Mavic Air or a totally refreshed Spark. Definitely not a Mavic 3.